No. 13 Virginia Tech bounced back in a big way from their first loss of the season. 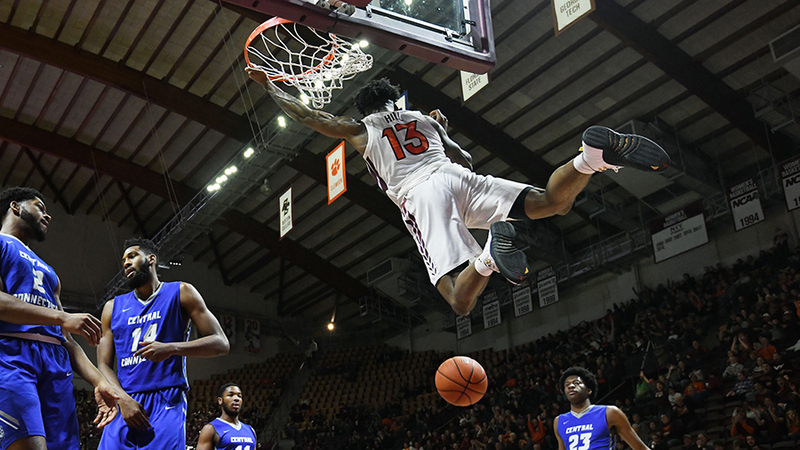 The Hokies obliterated the Central Connecticut State Blue Devils 94-40 on Saturday afternoon. Buzzketball improved to 6-1 on the season. Virginia Tech had four players score in double figures, led by Ahmed Hill with 24 total points. Nickeil Alexander-Walker (14 points), Ty Outlaw (15 points), and Kerry Blackshear Jr. (18 points) also broke into double-digits. Blackshear Jr. stood out against the Blue Devils. The 6'10" redshirt-junior started off by going 17 minutes without committing a foul. During that span, he scored 16 points on 7 for 11 shooting from the field. Blackshear's foul trouble has been well-documented this season. This game provided an opportunity for Hokie Nation to see what his potential is when he's not riding the pine. "I think, the best thing is, when I don't get in foul trouble, it doesn't put my teammates in a bind and we can all just play free," said Blackshear. "Then I'm not second guessing myself defensively or offensively and I think it just opens it up a lot for everybody." Justin Robinson only scored four points, but his overall production didn't drop off. He grabbed a team-high seven rebounds and dished out a school-record 13 assists. "I was watching the Penn State game and I made a lot of selfish plays," said Robinson. "I had one assist to six turnovers. And that's something that's not like me. I think when I watched that, it kind of hit me hard, I kind of just wanted to watch film every day and not talk to anybody. I think learning from that and coming out here and having 13 compared to 1 and 6, is a big step for my maturity and growth. I think [my teammates] trusting me, no matter what, to have the ball in my hands is big for my confidence." Robinson's assist-to-turnover rate on Saturday was 13 to 4. Though it was quite the surprise when starting lineups were announced and Robinson's name wasn't called. "It was not punishment, it was 'Let's play as big as we can and see what transpires from that and would that potentially lead us down a road where certain personnel groupings and certain play catalogs specific to that group, would it potentially open up something'," explained Williams after the game. Virginia Tech also hit a school-record 18 three-pointers. Hill led the charge from deep, nicely going 6 of 9 from beyond the arc. Throughout the Williams era, Virginia Tech has been known for their ability to splash the long ball. "If we force help, relative to the complexion of our roster and how we play, it's going to lead to uncontested threes, it's going to lead to long closeouts, and it's going to lead to a high percentage of assisted baskets," explained Williams. "If we're playing to force help, it's going to lead to a paint touch which is going to lead to rotation, and it's going to lead to a high percentage of three attempts." That's exactly what the Hokies got on Saturday. A high percentage of three attempts. 33 of them, in fact. Making 18 of them is impressive, though Alexander-Walker thinks it should be the norm. "We had a lot of plays [against Penn State] where we drove and drew a crowd," explained Alexander-Walker. "This game, I think we did a better job of passing the ball out. We're all great shooters, that's one thing that we know we can do. I feel like 18 could almost be a consistent thing because of how we shoot the ball and our ability to get to the paint. If we keep drawing guys in and hitting threes, it makes the game easier because now teams can't help even though they want to. It's really starting to open up the game for us." Virginia Tech's defense was also on full display on Saturday. The Hokies held the Blue Devils to 26% (14 for 54) shooting from the field, and forced 17 turnovers. Central Connecticut State wasn't even able to break the 20-point threshold in the second frame, scoring just 17 points after the break. Buzzketball's next opponent is VMI, with the Keydets invading Cassell Coliseum on December 5 at 7 o'clock. It'll be the 135th meeting all-time between the two schools. 20:00, 0-0 VT Well, Justin Robinson isn't starting today. Not really sure what prompted that decision by Williams. It'll be something to keep an eye on as the game progresses. 11:42, 25-13 VT Robinson checked in at the first media timeout. So that drama has been resolved, I suppose. Hokies are playing great basketball at the moment. Blackshear Jr. has not gotten in foul trouble and has 12 points already. Imagine that. 7:37, 36-16 VT Tyler Kohl was just ejected via a flagrant 2 foul. The foul that triggered the under-8 timeout didn't seem egregious, but it was reviewed during the break. Outlaw hit one of the two bonus free throws. 3:31, 43-23 VT This has been a clinical dismantling of the Blue Devils. The Hokies are shooting 65% from the field overall and 61% from beyond the arc. Virginia Tech's turnover-to-assist ratio is 2.8 at the moment. And they've had six different players put points on the board. 3:16, 43-23 VT Blackshear Jr. picks up his first foul of the game. Almost 17 minutes foul-free from the big man. That's something that hopefully will continue as the season progresses. The Hokies need his presence in the paint. 1:48, 46-23 VT And just like that, Kerry is back up to his standard two fouls in the first half. That didn't last long. 16:06, 64-28 VT Boy, that escalated quickly. The Hokies have started the second half with five three-pointers, including three from Ahmed Hill. 14:24, 67-28 VT Wabissa Bede just drained a three-pointer, but that wasn't the impressive part. During that possession, I think every single Hokie player had a shot they could've taken, but passed it to their teammate instead. 9:25, 79-33 VT One possession after P.J. Horne just missed on an alley-oop from Robinson, Hill ran a successful dunk play. This Hokies offense is a thing of beauty sometimes. 3:32, 87-34 VT Going to go out on a limb here and say that this game is over. Bold, but it'll probably hold true. Freshman guard Jonathan Kabongo was the lucky Hokie to push the lead over 50 points. Hill led the charge from deep, nicely going 6 of 9 from beyond the arc. This has been a clinical dismantling of the Blue Devils. I hope to hear this again this season. I posted this at the end of the game thread but its probably more appropriate here after the summary. Looking at the box score post game, the Hokies managed to hold a team shooting 50% from the field on the season to 25% for the game. Couple that with the Hokies hitting 11 of their first 13 shots, with five of those from beyond the perimeter, put CentCon in a major hole right from the start. It also didnt help CentCon that their leading scorer and all around floor leader was the player ejected with 7 minutes left to play in the first half. Only Joe Hugley on their side had remotely the same kind of game that they have had this season, scoring 13 points on 5-13 shooting. Everyone else either didnt attempt their normal shot count or were terrible. They came in averaging 17 points a game from the free throw line and only had five in this game. They also came in shooting 40% from outside, hitting almost 8 threes per contest. Tonight they managed seven of them but it took them 25 shots to do so rather than their normal 17. While the Hokies only forced CentCon into 2 more turnovers than normal at 17, the Hokies turned those 17 turnovers into 23 points compared to CentCon normally only giving up 11. The Hokies also were much more effective than normal in terms of second chance points off of Offensive rebounds. They got their normal 10 rebounds but turned that into nine points. One other area that really differentiates this game from the Penn State saga, the bench contributed 30 points in this contest. It also didnt hurt the Hokies that they shot 54.5% from the perimeter in this one, hitting 18 of 33, compared to their normal average of roughly 11 of 25. That was a fun game. Hopefully we can get into conference play with just the one loss, still have a month to go though. And hopefully by then we will have at least one more body suiting up for games (plz).